Hello! 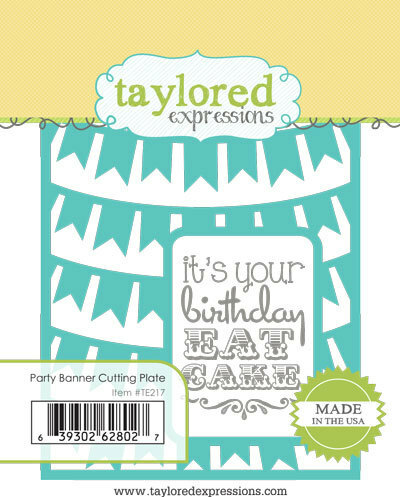 Welcome to the spotlight day of Taylored Expressions September Release! We are celebrating 5 years of TE with a BIG birthday bash! All of the new products are available in the TE store, here. This is the final day of release week, but we'll be partying all month long with something special each week, so be sure to stay tuned! It's hard to tell from the packaging photo, but I basically cut off the top 2 rows of banners to create space for my album title. I love the look of wood, so I used birch wood veneer paper for the cover. I cut 2 out of the wood and a third one out of thin chipboard so that my cover would be sturdy. To remove the banners and create the opening for my title, I used an Xacto knife. I sandwiched the chipboard in between the 2 layers of wood veneer and used red line tape to secure. Since I wanted the backside of the cover page to also show wood, I just flipped the wood veneer paper over before die cutting to make sure that the wood veneer would be face up on the back of the cover. I had no problems cutting either the wood veneer or thin chipboard, though I did use the metal shim adapter to ensure clean cuts. 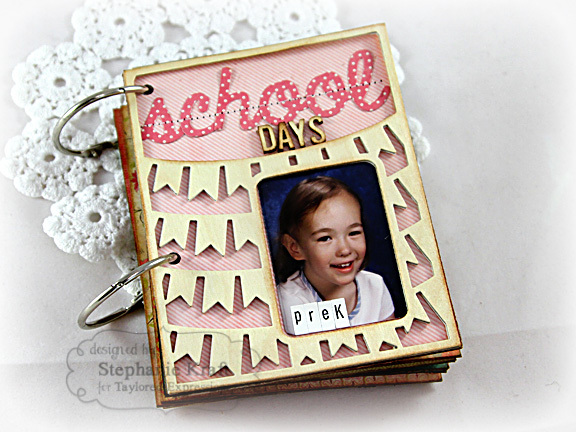 I added Vintage Photo Distress ink onto the embellishments and on the edges of the pages. The rest of my pages were cut the same size as the cutting plate (5.25" x 4"). I used chipboard and adhered patterned paper to each side. Each page is similar. For the grade level, I used the Whimsy Alpha and Whimsy #'s dies throughout my album. The letters and numbers were die cut using Choice Snow White cardstock. I used the doodle stamp from From Me to You on the bottom of each page. 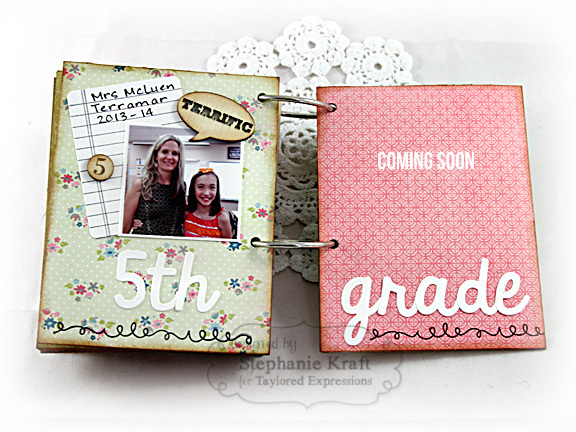 On the left side, I included a photo of Sabrina with her teacher and behind it a small journaling card with the teacher's name, school and school year. 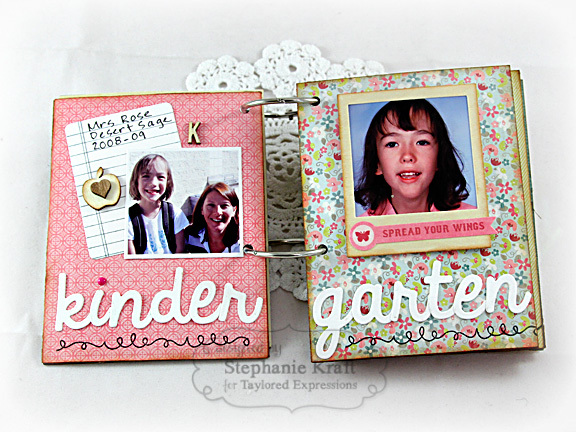 The journaling cards were created using the Notepaper stamp and cut with Labels Stacklets 6. The right side is the current year's school photo which I framed using the largest Instant Photo Frames (also cut out of the birch wood veneer). The word stickers under the frame are from various My Mind's Eye sticker sheets. All patterned paper is the from the MME Collectable - Memorable collection. To continue the wood theme, I used Studio Calico wood veneer embellishments throughout the album. It was fitting to end the book with 5th grade since next year will be the start of middle school. The school photo will be taken next week and once I get it, I'll add it to the album and finish it! The back cover is also birch wood veneer paper. The frame and sentiment uses From Me to You. Today's party game is Guess the Number! 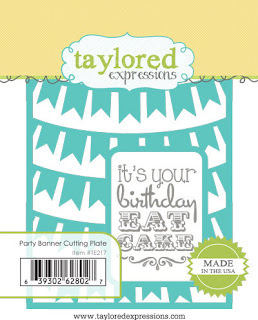 To find out how to play along and what prizes are up for grabs, please visit Taylor's blog! Thanks to all who have visited throughout release week! I always appreciate your sweet comments! Have a great weekend! Accessories: Taylored Dies: Party Banner Cutting Plate, From Me to You coordinating die, Labels Stacklets 6, Instant Photo Frames, Whimsy Alpha, Whimsy #s (TE); Letter Stickers (Making Memories), Word stickers (MME), Wood veneer embellishments (Studio Calico), Sprinkles (Doodlebug), Foam tape, Thread, Sewing machine. What a great idea! I'm gonna have to case this album idea! Simply adorable! Very nice job! This is really incredible, Stephanie! You are THE BEST MOM EVER!!!! Wow! Wow! WOW!! This is Really Amazing Stephanie!! 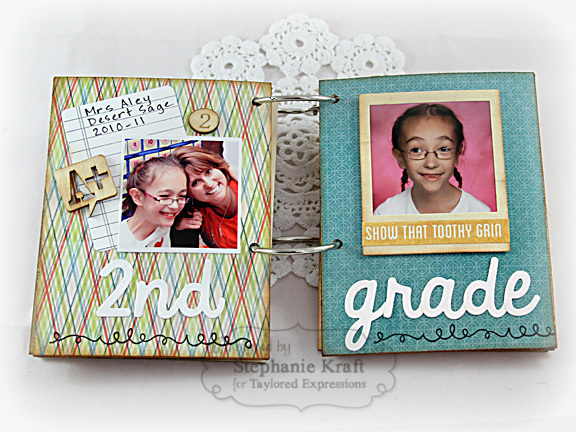 Love all the Fabulous details your combo of dies is AWESOME!! Love all the Sweet pics of Sabrina too! Just Love every Super detail Lady! Wow Stephanie! Wow a sweet album bursting with so many beautiful photos of Sabrina! What a great way to document her life! 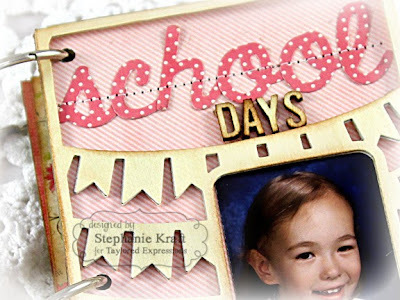 Oh Stephanie, this is really sweet! 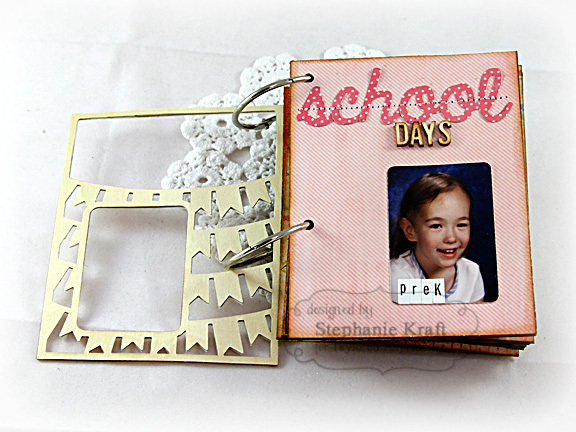 Love how you used wood veneer and all those pictures made my heart smile. What a sweetheart you have! Love it!!! What an awesome school album! Love the wood veneer accents.